We like this companion site, but we love the book more. Why? It’s crammed full of stories, and people, and insights, and trivia, and history, and inspiration about the big, blue and wonderfully weird world we live in. Robin Esrock spent over 10 years of life visiting over 100 countries in search of one-of-a-kind experiences. You know that oft-cited fact about if you spend 10,000 hours at something, you can become an expert at it? Well Robin spent way over 10,000 hours scouring the planet, from the Amazon to Zanzibar. It’s his job to find stories that will delight and dazzle, the kind of experiences that make great fodder for dinner parties, and even better desserts for life. Designed to be digested in small but meaningful chunks, it is a book that appeals to armchair and active travellers alike. The book’s format allows you to start anywhere, and it can take you anywhere too. Beautifully illustrated with photographs, the book unlocks exclusive digital content on this site, building a Bucket List community of readers around the world to debate, review and suggest new experiences for future editions. For a book rooted in the things to do before you die, The Great Global Bucket List is full of wonder, wit, and the reasons that make life worth living. I hear you thinking: Where can I buy it? 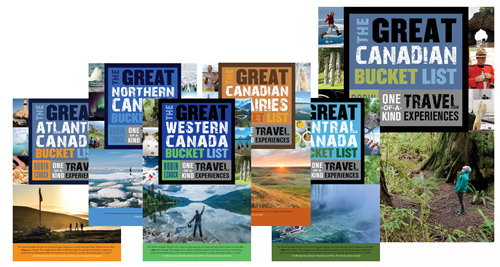 In Canada: The Great Global Bucket List is available at Chapters-Indigo, Amazon.ca, McNally Robinson, all quality independent bookstores, and of course, online too. It’s also available as an e-book. 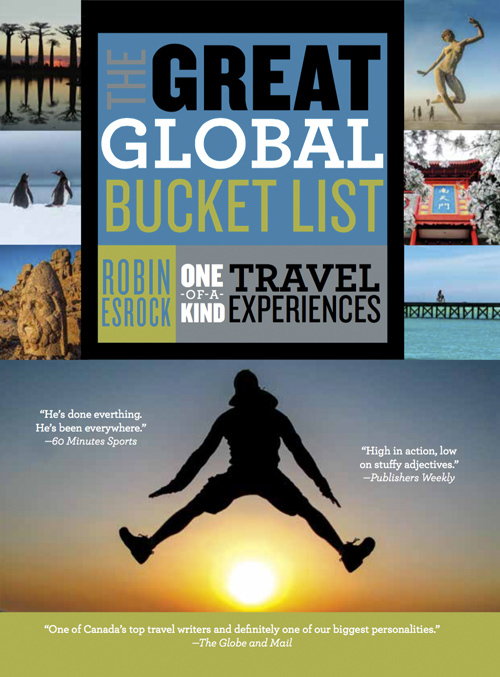 In the USA: you’ll find The Great Global Bucket List at Barnes and Noble, all quality bookstores, and on Amazon.com. In Australia and New Zealand: look for in quality bookstores and on Booktopia. In China: you can find a translated edition throughout the country in major retail, big box and airport bookstores, as well as online through through DangDang, JingdongMall, Tmall, Ookuu, Xinhua, Winshare, Amazon, Shanghai Yue Yue Books and Huludidi. Xie Xie! Full of adventure, humour, photos and fun facts, The Great Canadian Bucket List is the definitive list of things to do in Canada before you die. Frequently topping the charts as the country’s #1 selling guidebook, the critically acclaimed series of books shine a much needed spotlight on the one-of-a-kind destinations and activities of the Great White North. Renowned travel writer and TV host Robin Esrock spent years visiting every province and territory to craft the definitive national bucket list. He never expected Canada to offer so much, and neither will you. This isn”t your typical travel guide – it is an inspiration for your next trip. Spanning the outdoors, food, culture, history, adrenalin, and quirky, Robin”s personal journey to tick off the very best of Canada features well-known and hidden gems, infused with humour, trivia, advice, and unforgettable characters. Categorized by province and territory, The Great Canadian Bucket List gives readers a firsthand perspective on the ultimate activities and destinations Canada has to offer. or your favourite local bookseller.